Storing and keeping your makeup brushes is very essential to protect its vulnerable bristles and avoid dusts from falling over it. Ever since I started my way to makeup I never thought of this idea and just put my brushes everywhere thus exposing it to dusts and pollutants thus making my face prone to breakouts. Not storing it properly makes it more vulnerable to damage as well. Its like throwing away your money. I bought 3 variety packs for my brushes. It only cost me Php225. When i first open the pack I thought that it wouldn’t fit my brushes. But, what amazes me is that it’s stretchable, very easy to slide over my brush handles and has breathable tubes. I use it after every cleaning, storage purposes, and protection especially when I travel. Select the size that fits snugly over the brush ferrule or the part which holds the handle and the brush hairs together. 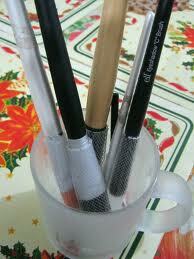 Make sure it will not slide back towards the brush handle nor crush the delicate bristles of your brushes. Slide over the brush handle onto the bristles until it extends 1/4 or 1/2 beyond the bristles and NOT vice versa. Don’t slide from the bristles to the handle because it will damage the hairs of your brushes. 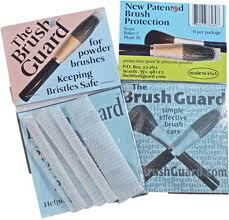 After washing your brushes, blot the water, shape and slip on the brush guard. Dry the bristles down using a mug or a cup or according to your preference. Please don’t dry it upwards. Water may damage the glue holding the brush hairs. I usually soak my brush guards to a hot water when cleaning just like soaking the spoon and fork in a bucket. The hot water kills the germs and bacteria. These brushes are available online. I haven’t found it anywhere here on our local stores. Fortunately, i was referred by a friend on this online site. The owner is Cebu base so I got the brush guard packs without any shipping fees.